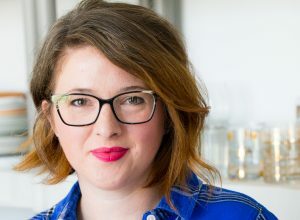 This post, Montmorency Tart Cherry Amaretto Pie, is sponsored on behalf of the Cherry Marketing Institute. All opinions are, as always, my own. November has to be my favorite month to cook. The temps are dropping and it’s still early in the holiday season with so many wonderful days ahead of us to enjoy with family and friends. I definitely have set Thanksgiving recipes that I adore (like my Marshmallow Pecan Sweet Potato Casserole) but every year it’s fun to come up with new recipes to explore and new get togethers to be a part of – like Friendsgiving! I am new to the Friendsgiving scene, but I love the idea of having a day to get together with friends to celebrate our friendship and all that we are thankful for. Thanksgiving for us is always spent with family so having a day designated to our friends is pretty awesome. This year, we are going to be doing a little traveling around Thanksgiving, so I’m having a virtual Friendsgiving with a few of my favorite bloggers! In addition to being a twist on the traditional holiday, it’s a great opportunity to try out some new and exciting recipes. 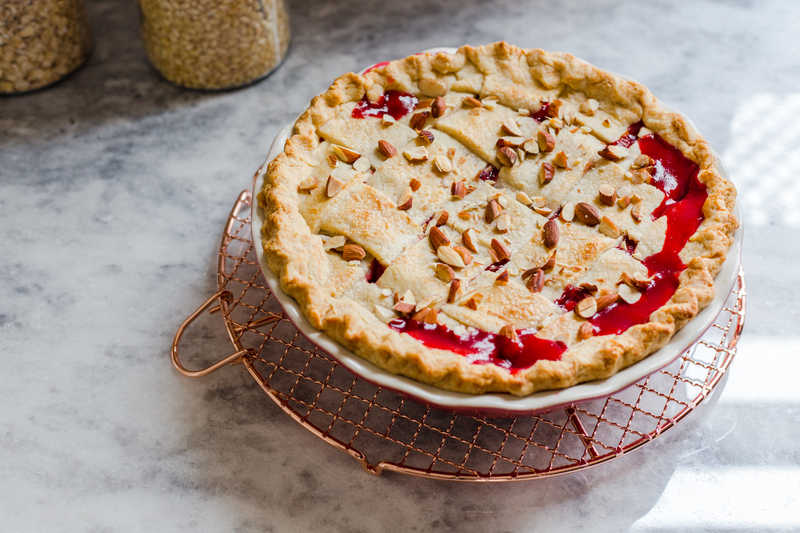 We are all creating unique Friendsgiving recipes to share with each other, all that feature Montmorency tart cherries! 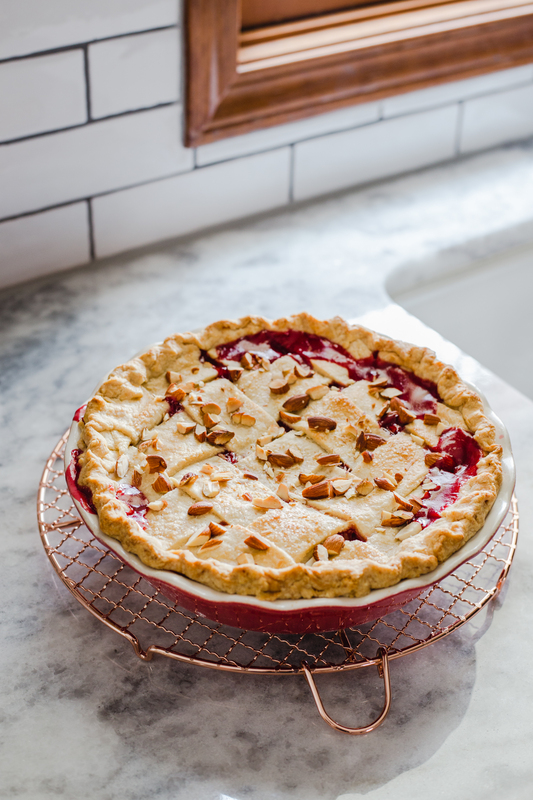 Adding Montmorency tart cherries to your favorite recipes are a great way to enhance flavor with their sour-sweet taste as well as leverage potential health benefits. Montmorency tart cherries are also a U.S.-grown superfruit sourced from small family orchards. That means choosing Montmorency tart cherries can help support local agriculture and preserve generations-old family farms. It’s hard not to think of pie when it comes to November. 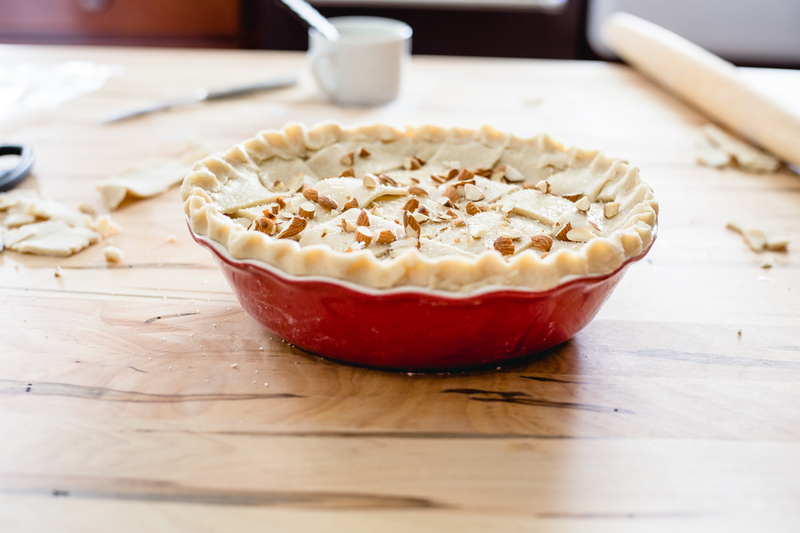 Pies are all around and the perfect dessert for any holiday gathering. 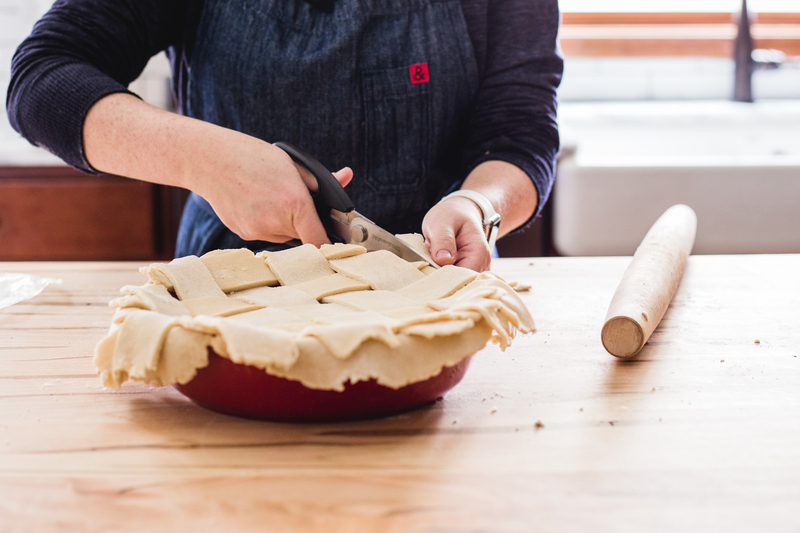 When was the last time you made a from-scratch pie? For many of us, it has possibly been a while, but I encourage you to give it a shot this month – whether it be for a festive Friendsgiving get together or your family’s Thanksgiving dinner. I am all about cherry pie! 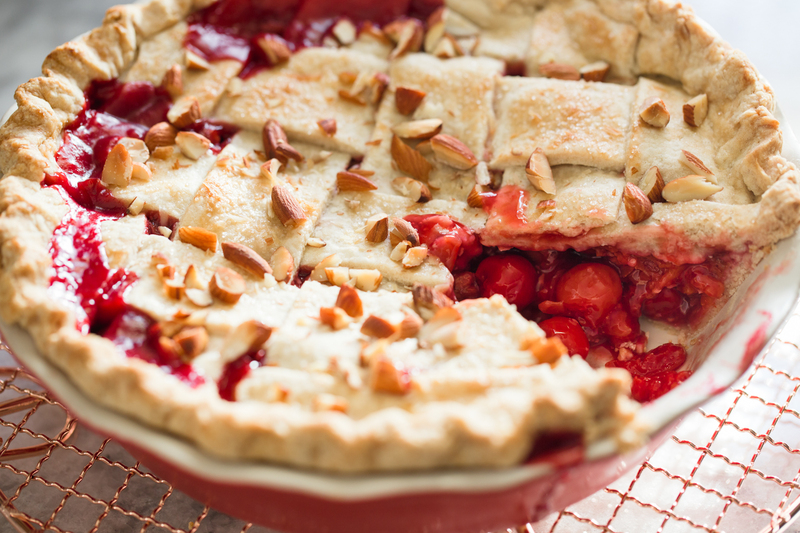 My Montmorency Tart Cherry Amaretto Pie is a slight twist on a classic. 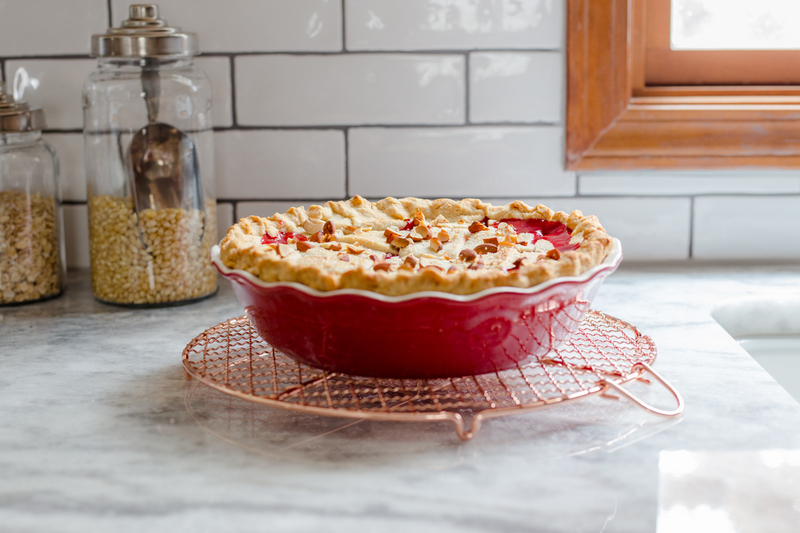 With ruby red Montmorency tart cherries and smooth, sweet amaretto liqueur, this pie is a show stopper. Plus, it’s honestly so rewarding to create a pie from start to finish. To look at the finished gorgeous pie and say “I made that!”. 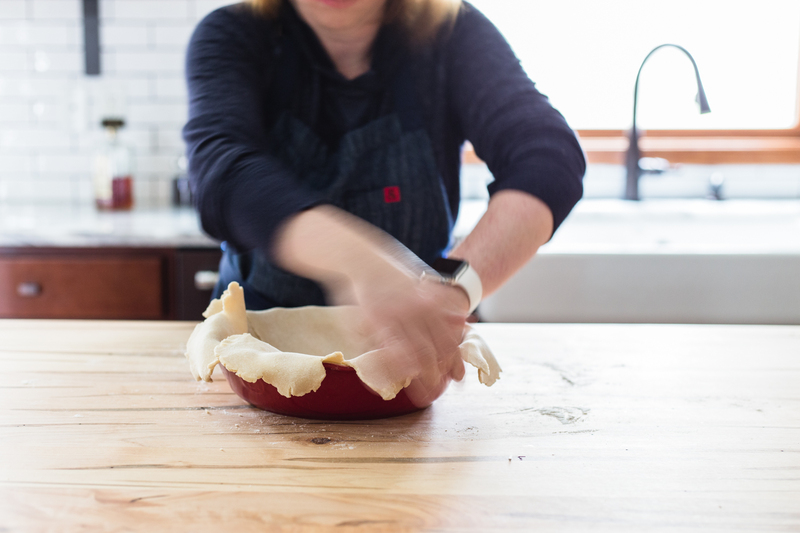 Don’t be intimidated by making pie crust. I used to be so nervous about pie crust until I started making it in the food processor and the steps could not be easier. The filling of this pie is made from canned Montmorency Tart Cherry Pie filling mixed with canned Montmorency tart cherries in water. I drained the water from the canned cherries then mixed them into the canned pie filling. 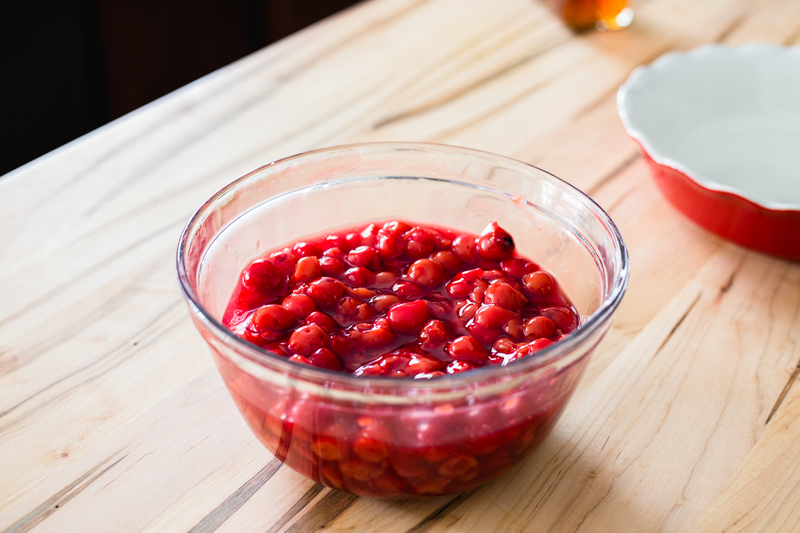 This creates a filling that is packed full of cherries with just enough sweetness from the pie filling sauce. Did you know that these canned Montmorency cherries not only are delicious, but are actually full of health benefits? Montmorency tart cherries are abundant in anthocyanins – a natural compound that contributes to the ruby-red color and distinctive sour-sweet taste. 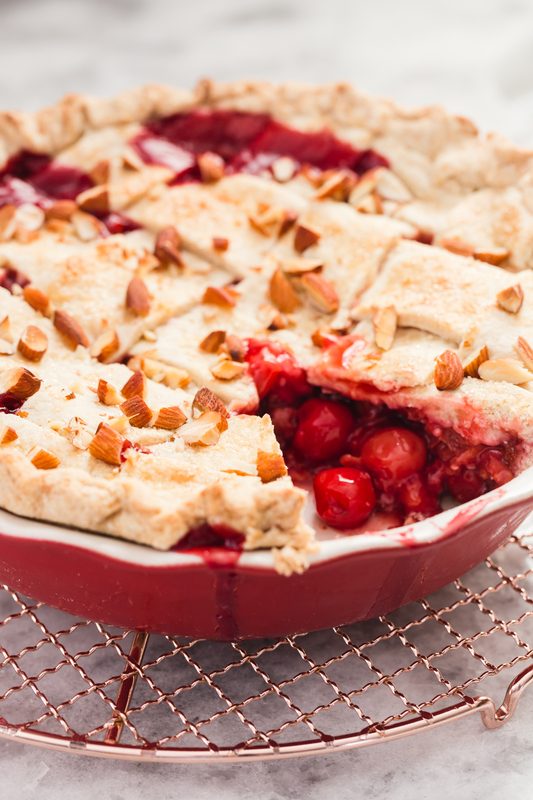 Montmorency tart cherries are one of the few food sources of melatonin. Researchers are continuing to investigate more potential sleep benefits of tart cherry juice. Eating a slice of my Montmorency Tart Cherry Amaretto pie at the end of your Friendsgiving feast is a great idea. Check out our full Friendsgiving menu over on choosecherries.com . 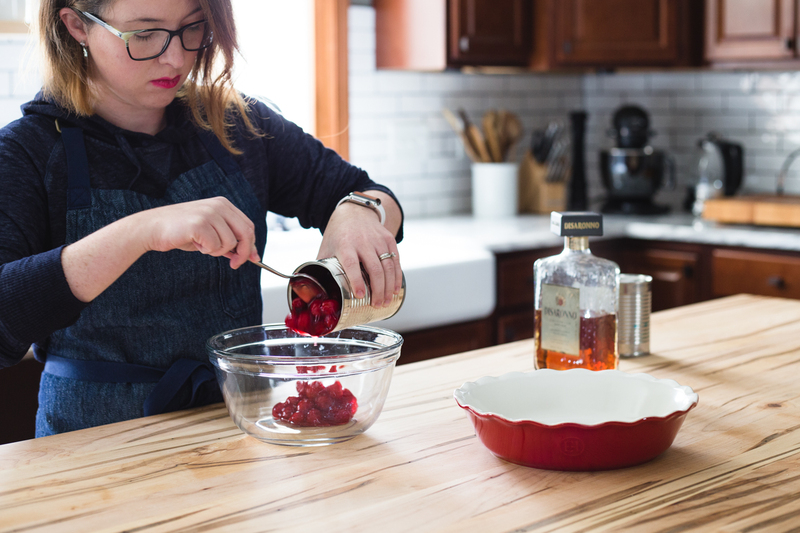 There you’ll find more great Friendsgiving recipe inspiration featuring these gorgeous tart cherries. Place flour, sugar, and salt in the bowl of a food processor and pulse a few times to mix. Add butter and pulse in short pulses until butter is incorporated in small pieces. With lid on, drizzle in water through small opening while pulsing. 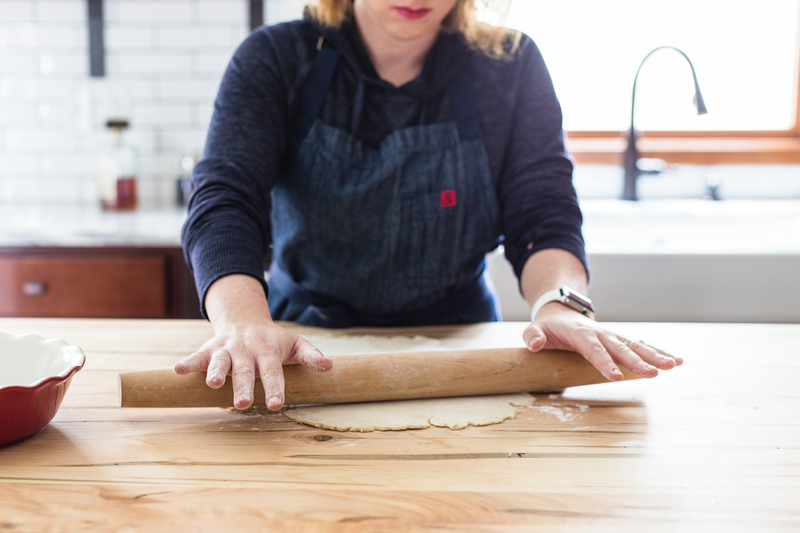 Test dough by pinching a small amount between fingers. If dough sticks together, then it’s ready. If it is still a little too dry, add a tiny bit more water until it passes the pinch test. Spread out two pieces of plastic wrap on your work surface. Divide pie crust dough between the plastic wrap sheets and form each into a disc. Wrap each disc of dough and refrigerate for at least 2 hours or up to 2 days. Pull dough out of fridge about 10-15 minutes before rolling out. Place oven rack in the lower third position of oven. Preheat oven to 425°F. 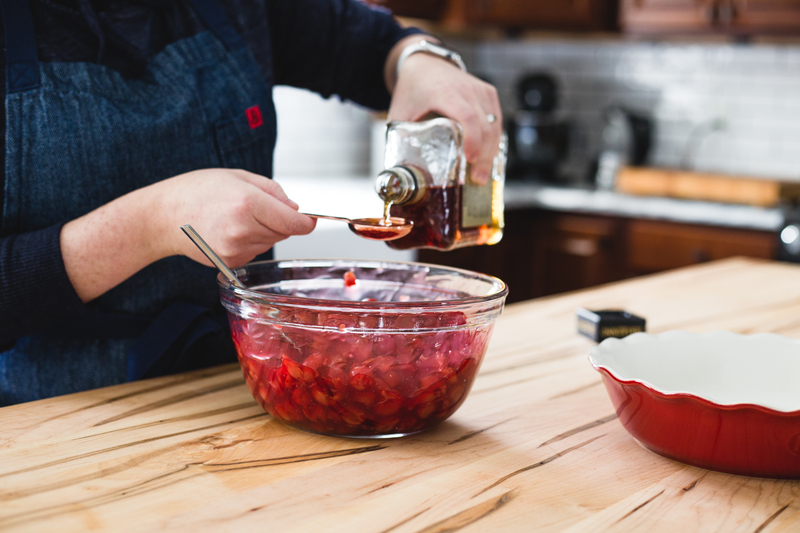 In a large bowl, stir together Montmorency tart cherry pie filling and the drained Montmorency canned tart cherries. Add amaretto liqueur and stir to combine. Set aside. 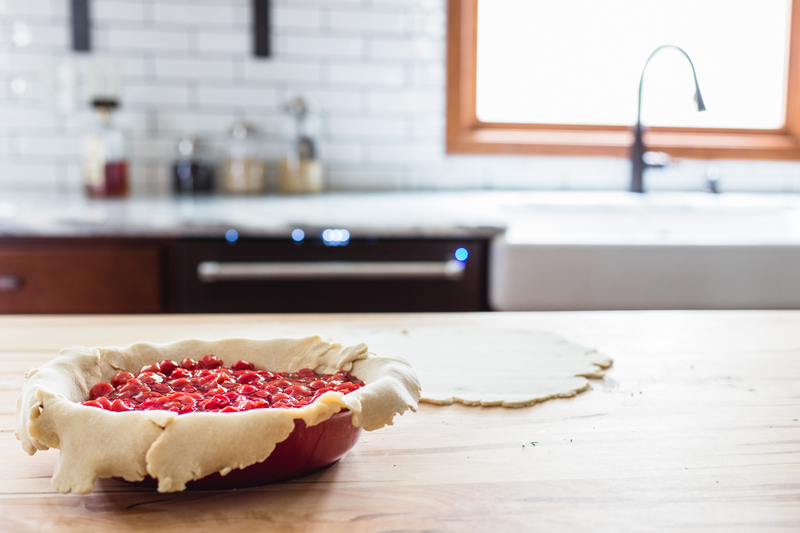 Roll out one disc of dough to a 12 inch circle and place in glass or ceramic pie dish. Gently press dough into sides and allow extra to hang over edge. Pour cherry filling into crust. Roll out second disc of dough and cut into lattice strips. Weave crust over pie filling (or form your preferred top crust style!). 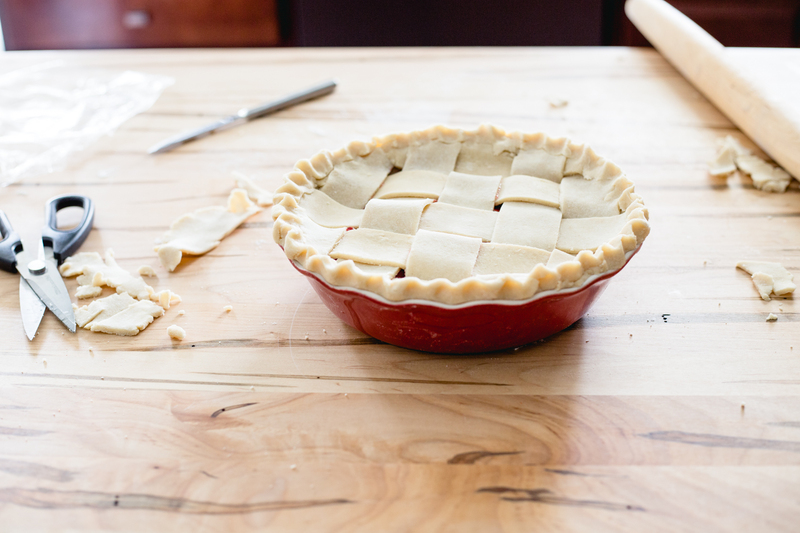 Trim extra pie dough with kitchen scissors, fold edges under and crimp. Thanks so much, Gina!! <3 I forgot how much I love amaretto until I mixed it in with the cherries - so good! !